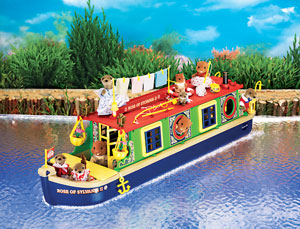 For fun, adventure and happy Sylvanian Holidays, sail away on the 'Rose of Sylvania II' - the boat that's a home on water. The Canal Boat comes fully furnished and equipped with a galley kitchen featuring stove, sink and fold away table. The compact but functional bathroom includes a toilet and shower, and the cabin bedroom features a cosy bunk bed for snuggling down in at the end of a busy day on the river - not to mention all the other maritime accessories on the roof of the boat, essential for those long summer days!